Sancintya Mohini Simpson, Kala Pani, 2018. Watercolour and gouache on handmade wasli paper, 88 x 63cm. Photo: Louis Lim. Courtesy: The artist. Do we need an art world #metoo moment? Collectors are taking their support of artists to the studio. Navigating the wild world of artist copyright. What makes a gallery go the distance? Art History 101 for the discerning collector. What’s it really like to be a VIP in the art world? Is the art/commerce dichotomy a luxury of the privileged? Which art schools are turning out the best talent? A major Australian survey takes over Sydney’s three largest institutions. The local and international art fairs on our calendars. An unconventional approach at this year’s Auckland Art Fair gives collectors access to vetted talent. The must-see exhibitions this quarter. Corbett and Yueji Lyon’s $14.5 million Housemuseum expansion. 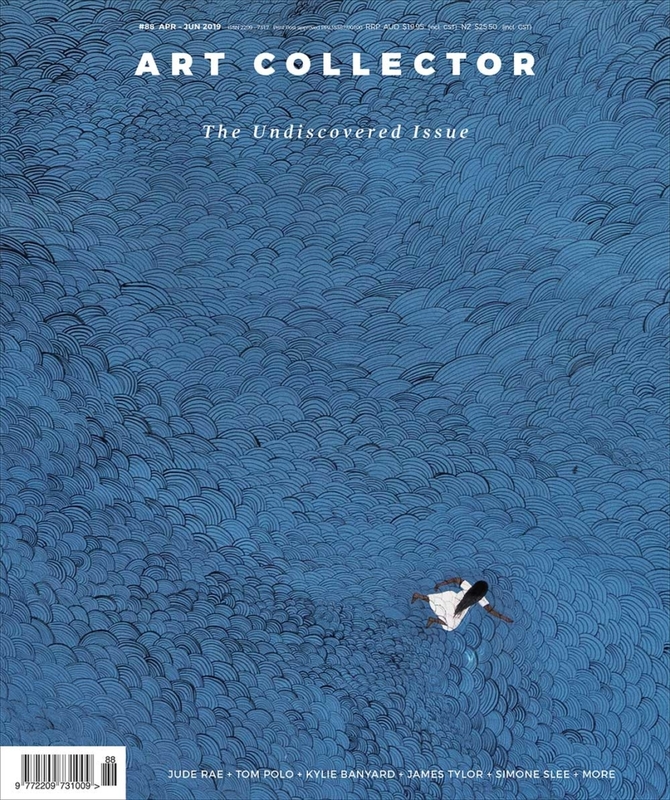 A new publication reads like a who’s who of the Sydney art world. Melbourne-based curator Sophia Cai presents the artwork on her wish list. Our writers speak to two established artists about their recent work. We introduce the work of three artists for your radar. The artists who have recently captured ACE Open CEO Liz Nowell’s attention. The unrepresented artists you should be paying attention to. Courtney Kidd on how Jude Rae has made her mark on Australian painting. Kylie Banyard is looking at the future with fresh eyes. Andrew Frost writes. Micheal Do explores the enigmatic compositions of painter Tom Polo. Jessica Clark looks at James Tylor’s recent works that place masculinity in centre frame. Angela Tiatia draws on an ancient myth to explore self-absorption today. Francis McWhannell reflects. Jane O’Sullivan on the whip-fast wit of Kenny Pittock. Buku-LarrŋgayMulka Art Centre is making magic. This ARI turned commercial gallery is no one-trick pony. Lindsay Clement-Meehan is a new breed of young collector. The notable commercial gallery exhibitions across Australia and New Zealand this quarter. Recent exhibitions reviewed by our writers in 30 words or less. Micheal Do on why we should remember Primavera 2018. Mariam Arcilla is a freelance writer and artsworker. Now based in Sydney, the former Gold Coaster previously worked as a gallerist, curator and ARI director. Lucinda Bennett is a writer and curator based in Aotearoa New Zealand. She is currenly the visual arts editor at the Pantograph Punch. Dr Rex Butler’s research interests include Australian art and art criticism, post-war American art and critical theory. He is an art historian and professor at Monash University in Melbourne. Sophia Cai’s curatorial practice focuses on Asian art history, the intersection between contemporary art and craft, as well as feminist methodologies and community-based practices. Sophia holds a Masters in History of Art from the Courtauld Institute of Art, London. Jessica Clark currently works between Adelaide and Melbourne curating a multi-layered exhibition project for Country Arts SA, VIETNAM – ONE IN, ALL IN, and RMIT University’s large-scale public art project, Law of the Land. She is an independent curator, writer, and arts manager with a background in art theory and education. Claire G. Coleman is a Noongar woman who writes fiction, essays and poetry while (mostly) travelling around the continent now called Australia in a ragged caravan towed by an ancient troopy. Dr Ashley Crawford is the author of a number of books on Australian art, including Transformations: The Work of Sonia Payes and Spray: The Work of Howard Arkley. Ineke Dane is interested in overlaps between architecture, politics, society and the environment, and a progression towards seamlessness between art and life. She is a curator currently based in Brisbane where she works with the international studio Urban Art Projects. Micheal Do recently curated Soft Core, a travelling exhibition for Casula Powerhouse Arts Centre and Not Niwe, Not Nieuw, Not Neu for 4A Centre for Contemporary Asian Art in Sydney. Dr Andrew Frost is an art critic, broadcaster and lecturer. Kirstin Gollings is a freelance photographer based in Melbourne. John Hurrell is the editor of EyeContact and is a New Zealand-based writer, artist and curator. Victoria Hynes has been a columnist for the Sydney Morning Herald and written for numerous Australian and international art magazines. Based in Sydney, she is currently contributing editor at Asian Art News magazine. Jacquie Manning is a photographer based in Sydney. Louise Martin-Chew is a freelance arts writer based in Brisbane. Emil McAvoy’s practice examines histories and concepts of the cultural roles of artists. Based in Auckland, he works as an artist, lecturer, art writer and gallery and museum professional. Helen McKenzie conducts international art tours for Art Collector subscribers and readers and works out of Sydney as an art adviser and freelance writer. Francis McWhannell has contributed to a variety of arts and culture magazines and websites including Art News New Zealand, HOME and Runway Conversations. He is based in New Zealand and is curating Projects as part of this year’s Auckland Art Fair. Joanna Mendelssohn is an art historian specialising in Australian art. Carrie Miller is a freelance writer based in Wollongong. Tai Mitsuji holds a masters in art history from the University of Oxford. He has contributed to publications including Art and Australia, Art Monthly Australasia, Art Guide Australia and The Sydney Morning Herald. Based in Sydney, he also works as a curator. Emma O’Neill is a freelance arts writer and former editor of Art Collector. Jane O’Sullivan has written for publications including the Australian Financial Review, Artnet, Art Guide and Ocula. She is a former editor of Art Collector. Ingrid Periz writes about contemporary art from her home outside Princeton, New Jersey. Andrew Purvis is a curator, writer and artist based in Adelaide. He is the curator at Adelaide Central Gallery. Laurence Simmons is Professor of Film Studies at The University of Auckland. Last year he co-curated the travelling exhibition Gordon Walters: New Vision and co-edited the accompanying catalogue. Hilary Wardhaugh is a freelance photographer based in Canberra. Zan Wimberley is a photographer who works in the arts, photographing art documentation, portraits, performance and more across Melbourne and Sydney. Sharne Wolff is a freelance arts writer based near Byron Bay. Chloé Wolifson writes about contemporary art and ideas for publications including Art + Australia, Art Monthly Australasia, ArtAsiaPacific and Frieze. Coen Young is a Sydney-based artist.